Buffy the Vampire Slayer and Kim Possible – separated at birth? Buffy Summers – a small kick-arse powerhouse. Independent, with a streak of romance. Fiercely loyal to her friends. Highly developed sense of responsibility. A knack with one-liners when demolishing bad guys. Extremely fashion conscious. Practical. 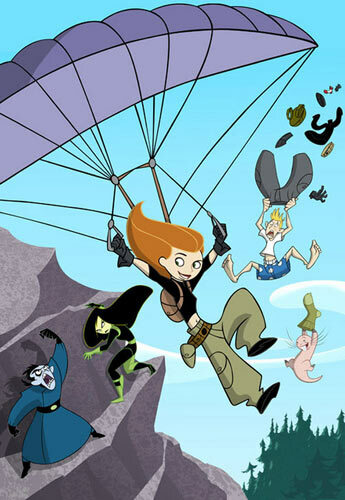 Kim Possible – a small kick-arse powerhouse. Independent, with a streak of romance. Fiercely loyal to her friends. Highly developed sense of responsibility. A knack with one-liners when demolishing bad guys. Extremely fashion conscious. Practical AND highly intelligent. And they both have great puppy dog eyes when they really want something. OK, so Kimmy is really intelligent and Buffy not so much, but then look at the advantages Kim has – a physicist father and a surgeon mother. But otherwise? Definitely sisters under the skin. That’s not uncommon though with lead characters – especially female ones – in this genre. Let’s check out the other match-ups in terms of their supporting crew. Xander and Ron Stoppable – on the surface, complete incompetents. Dig a little deeper, and yep, still incompetents. They get cursed, taken over, have crushes on people who turn out to be insects or bad guys and are totally accident prone. They are the comic relief. Every now and again, they have an unexpected success which totally goes to their heads. And they need Kim and Buffy to look after them. But keep looking, and you see that in many ways, they are the moral compasses for Kim and Buffy. As the series go on, they both develop a kind of Zen wisdom and learn and grow. And in their very incompetence, they progress the plot and often help to come to a resolution. And Kim and Buffy both view them as essential parts of the team. Cordelia and Bonnie – the arch-rivals. Both selfish, horrible, cheer leaders, rich, fashionistas, cruel and shallow. They are mean and nasty, need rescuing frequently and become an integral part of the story as time goes by and you kinda come to like them. Giles and Wade – at first I was thinking that Wade and Willow were the analogues, but no. Wade and Giles are both watchers – in fact, Giles is even called “The Watcher”, and how long does it take before KP actually meets Wade in person? They rarely get involved in the action, but provide the requisite information to our heroes. They are organised, excellent at information gathering, and have secret caches of cool toys to give to our heroes. Willow and Rufus. 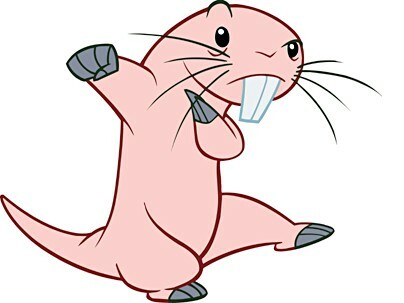 Yes, I am comparing the incomparable Alyson Hannigan to Rufus the naked mole rat. They both seem defenceless and harmless, but actually have fantastic ideas, and are surprisingly hard to kill. Their longevity is outstanding and when they get to be the powerful ones, they are truly powerful. And they are in the shows from the very beginning to the very end. Willow gets to change more throughout the series, but their “are you serious?” and “how stupid are you really?” eye rolls are identical. Rufus does like food more than Willow, although that may be the influence of Ron! Dawn and the Tweebs – OK, I know there are two tweebs, and they are boys. They also have mad inventing skills and get into trouble all the time. But I’m sorry, Dawn was The Key, and after that, she was a bratty younger sister. The trouble she got into was world-shattering. These three are definitely the same characters! And now the bad guys. Well there’s Drakken. He even LOOKS like a vampire, but he’s that ambiguous bad guy – sometimes bad, sometimes good. Just like, say Spike, or Angel. And then there’s Shego, and it’s hard to find an equivalent to her, but again, I’d have to go with Spike I think, although clearly she is not a love interest for Kim Possible. She does see all of Kim though, and seems to be more aware of Kim’s imperfections than any of the other characters. The villains in Buffy are clearly nastier than the ones in Kim Possible, but that’s a function of the ages the shows are rated for. But there are a fair share of cheesy villains in Buffy, just as there are in Kim (Duff Killigan anyone?). But both shows do not shrink from having bad things happen to good people – just check out the number of teenagers in both that get turned into something else (Gil in the Camp Wannaweep episodes in KP, Jesse in the first couple of Buffy episodes and the list goes on). One of the things I really like about both shows is that they do turn gender stereotyping on its head. The girls are strong, independent, capable characters, who are still allowed to look attractive. The shows also turn the notion that adults are all-powerful and always right upside down. The adults in both shows do their best, and in some cases that is more than good enough. But in some cases it’s not. The parents in these shows clearly love their daughters and support them as best they can. And it has to be said that both mothers are truly awesome when they get a chance to show their stuff. The other commonality about both shows is that they are set throughout the characters’ high school years and they are not afraid to progress the characters through high school and beyond. And while they’re at high school, not only are the two gangs saving the world, they’re also having to do homework and attend class – juggling cheerleading and slaying/ helping people. 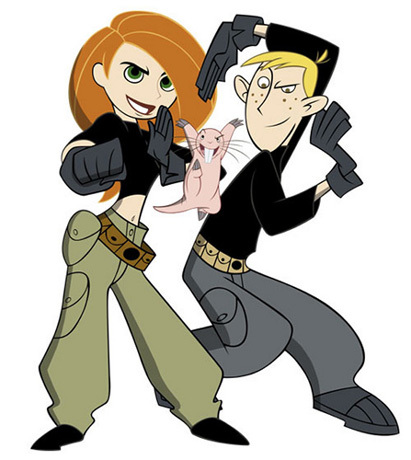 In case you’ve been living in a cave and have not watched either of these great shows, here are their Wikipedia pages – Buffy the Vampire Slayer and Kim Possible. I highly recommend them both. What are some kids’ shows that you have found with real similarities to each other? And which ones are you keen to show your own children (or other people’s borrowed children)? Jay, you are SO RIGHT! How could I not have thought of Faith!!! Well done, and thanks for stopping by! True. But then Shego came from a family of superheroes, so had a better start in life 🙂 Thanks for stopping by! I think you have slightly missed the full jobke about Kim’s parents: Her father is a Rocket Scientist & her mother is a Brain Surgeon. Also, Ron has his own growth arc and ends up as much more than a sidekick..
It’s probably unnecessary, but I’d like to compare Global Justice, to the Initiative. That’s totally in line! Great job finding another point of similarity!